Don't wear it in water, especially salt water or chlorinated water which is hard on brass, gemstones and crystal; the water may cause spotting on the brass. If you forget and wear your bullet pendant in the shower wipe it dry immediately. If your bullet pendant has a bail, turn your pendant upside down and let any water drain out. If it's a side drill, turn it sideways. You may want to prop the bullet up for several minutes, then dry it with a soft cloth. Some gemstones are porous and will absorb cleaning chemicals. 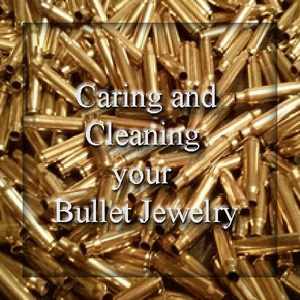 Don't clean your bullet by soaking it in any kind of liquid cleaner. Porous gemstones will absorb chemicals and possibly damage the gemstone, dull or discolor them. Once this happens you'll most likely never get your gemstone back to its original condition. The best method of cleaning a brass bullet containing a gem or crystal is to simply keep it clean by buffing it lightly with a soft dry cloth. If you keep your brass (or copper) clean it shouldn't turn your skin green and it will retain its original brightness. A tiny bit of Brasso (a commercial brass cleaner) works wonders for cleaning your bullet pendant. Place a dab about half the size of a pea onto a dry soft cloth and work it into the cloth. Gently wipe your bullet pendant leaving a light coating of Brasso on it; a thin coating is all you need. Allow it to dry for a minute or two. Lightly buff off the dried Brasso with another soft cloth, no need to buff hard. You will now have a beautiful shine on your bullet pendant. Use the same dry cloth you've buffed with, the one with the dry Brasso residue on it, to gently wipe your gemstone or crystal. This will give the stone or crystal a new luster and shine. Not many people know that Brasso is used to polish amber, which is an extremely porous gemstone. A good quality car wax or carnauba car wax is another excellent product to keep your brass and copper looking like new. Use it with the same method I mentioned above and your metal jewelry will look like new. Once you've cleaned your bullet casing, you'll want to retain the shine by storing it in an air tight baggie or container. The trick to keeping most metals from tarnishing or turning your skin a weird color is to KEEP IT CLEAN, it's that simple. Most likely you're not allergic to copper or brass even if it turns your skin colors; it's because the metal is dirty. Sweat, perfume, lotions, soaps, among lots of other daily items deposit chemicals on your skin. Once your skin perspires it reacts to the metal you're wearing (speaking mostly of copper, and bronze) and oxidizes it. It's the oxidation on the metal that deposits onto your skin turning it green. It's not your skin; it's a layer that has been deposited from the oxidation of dirty metal. All you have to do is keep your copper, brass, silver and bronze jewelry clean and dry in-between wearing. Wipe it with a dry cloth before you put it away or before you wear it. If you've had a day where you find yourself hot and sweaty, take your jewelry off, quickly rinse it with water then immediately dry your jewelry and put it away.